Since it (AR 549) ended before the LA state line for quite some time, I would classify it as a "stub end" during that period (albeit a relatively lengthy "stub"); if someone has a more appropriate term, I certainly wouldn't quibble. Seems to be a moot point these days as I-49 has been in place for several years. If the map is dated to 2019, presumably they'll be open by then. Huh? AR 440 opened to traffic in 2003. IIRC there was at one time a very tentative proposal to extend AR 440 north and west as a loop around North Little Rock and rejoining I-40 somewhere around the I-430 interchange; perhaps the AR Roadgeek is making reference to that potential extension -- the plans for which don't seem to have been followed up by any further action. I believe so, AR 440 is a stub at an interchange with itself and US 67. It could (one day) pick back up, but unlikely. Also sparker, I recall reading somewhere in plans or on here about a loop regarding AR 440 around NLR and a reconnection point. An AR 440 extension to AR 107 would be extremely useful. However, west of that any farther extension would be problematic because of Camp Robinson. The new highway would have to be routed around it and through developed areas, with a fearsome ROW tab. Perhaps they are shifting the funding in part to increase their odds of getting the INFRA grant. Danny Straessle, a spokesman for the Arkansas Department of Transportation, said Thursday no Arkansas projects made the cut. A list of projects was released earlier this week. 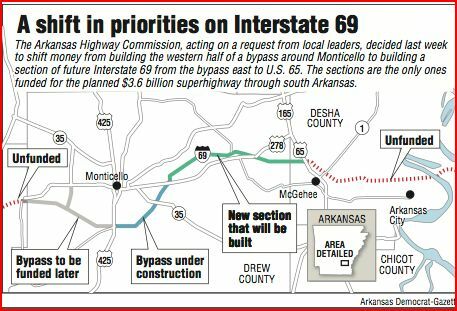 It's a little dated news, but this February 11 article reports that the Arkansas Highway Commission followed the lead of the Southeast Arkansas Cornerstone Coalition and shifted the money intended for the western part of the Monticello Bypass to building I-69 east to U.S. 65. IIRC, that eastern extension to US 65 is a full-width ROW like what's U.C. now, but also with 2 lanes as per present construction. Will this include any grade separation structures or will simply be the initial lanes of the eventual facility, with at-grade interim intersections? WHEN: Thursday, October 11 at 11:00 a.m.
WHERE: See attached map. Travel south on U.S Highway 425 to the intersection of Future U.S. Highway 69, turn east on 278 Bypass, proceed for one mile to event site. tempting, but can't do it on less than 24 hours notice. Wait! Did they say US 69? Of course they did. They're garden-variety PR folks who can't be bothered to (a) vet their info through the planners down the hall, or (b) discern any details about things that don't personally affect them. Nevertheless, that certainly isn't enhancing their employer's reputation! I hope there is a US 69 shield in the field up there. That would make the trip worth taking. I'll bet that the guys in the field are a bit more savvy than your typical HQ PR flack; besides, there's been a few "future corridor" MGS's in the field with a shield facsimile for comparison. And -- most telling -- since US 69 never entered the state, there's no US 69 shields lying around in some corporate yard to be misappropriated! That kind of mess is one of the big reasons I'm not wild about the interstate being numbered 69 in TX. There will be potential for all kinds of wrong-type/wrong-highway mixups and such. Few will know which 69 is meant in those cases. Well, TX has been duplicating designations for as long as I can remember (35, 87, 20 -- the list goes on). Would be fun to see if any wrong shield types have been posted over the years (pictures would be appreciated!). Bypass US 278? What happened to the Highway 569 designation? Once the whole Monticello Bypass is complete, could the bypass be given the mainline US 278 designation, given that making it a four-lane Interstate 69 freeway is light-years away? I find that designation very interesting. Perhaps Arkansas may be giving up on I-69 despite their future corridor signs? At this point, doubtful. Until more of the corridor is built, this "half bypass" has only one function, and that is to bypass US 278's eastern portion in Monticello. The designation is appropriate for that purpose, since US 425 traffic intending to turn east on US 278 can now bypass the in-town segment on the new alignment. 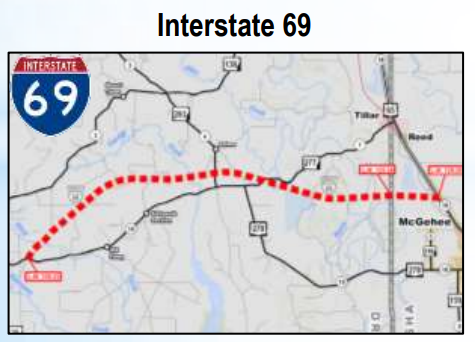 If the remainder presently planned eastward to US 65 at McGehee is also 2 lanes as well, expect that bypass designation to continue east -- unless ARDOT simply decides to reroute the US 278 mainline over the nascent I-69 alignment. Until either divided segments are built, or grade separation structures are in the works, don't expect to see any I-69 field references beyond the sporadic stuff that's deployed right now. As arguably the most isolated portion of the whole I-69 corridor -- and, as such, not really useful as a functional (as opposed to legislated) SIU -- premature signage would be something of a joke!